For other uses, see Pizza (disambiguation). The word "pizza" first appeared in a Latin text from the central Italian town of Gaeta, then still part of the Byzantine Empire, in 997 AD; the text states that a tenant of certain property is to give the bishop of Gaeta duodecim pizze ("twelve pizzas") every Christmas Day, and another twelve every Easter Sunday. Byzantine Greek and Late Latin pitta > pizza, cf. Modern Greek pitta bread and the Apulia and Calabrian (then Byzantine Italy) pitta, a round flat bread baked in the oven at high temperature sometimes with toppings. The word pitta can in turn be traced to either Ancient Greek πικτή (pikte), "fermented pastry", which in Latin became "picta", or Ancient Greek πίσσα (pissa, Attic πίττα, pitta), "pitch", or pḗtea, "bran" (pētítēs, "bran bread"). The Etymological Dictionary of the Italian Language explains it as coming from dialectal pinza "clamp", as in modern Italian pinze "pliers, pincers, tongs, forceps". Their origin is from Latin pinsere "to pound, stamp". The Lombardic word bizzo or pizzo meaning "mouthful" (related to the English words "bit" and "bite"), which was brought to Italy in the middle of the 6th century AD by the invading Lombards. Foods similar to pizza have been made since the Neolithic Age. Records of people adding other ingredients to bread to make it more flavorful can be found throughout ancient history. In the 6th century BC, the Persian soldiers of Achaemenid Empire during the rule King Darius I baked flatbreads with cheese and dates on top of their battle shields and the ancient Greeks supplemented their bread with oils, herbs, and cheese. An early reference to a pizza-like food occurs in the Aeneid, when Celaeno, queen of the Harpies, foretells that the Trojans would not find peace until they are forced by hunger to eat their tables (Book III). In Book VII, Aeneas and his men are served a meal that includes round cakes (like pita bread) topped with cooked vegetables. When they eat the bread, they realize that these are the "tables" prophesied by Celaeno. Modern pizza evolved from similar flatbread dishes in Naples, Italy, in the 18th or early 19th century. Prior to that time, flatbread was often topped with ingredients such as garlic, salt, lard, cheese, and basil. It is uncertain when tomatoes were first added and there are many conflicting claims. Until about 1830, pizza was sold from open-air stands and out of pizza bakeries, antecedents to modern pizzerias. A popular contemporary legend holds that the archetypal pizza, pizza Margherita, was invented in 1889, when the Royal Palace of Capodimonte commissioned the Neapolitan pizzaiolo (pizza maker) Raffaele Esposito to create a pizza in honor of the visiting Queen Margherita. Of the three different pizzas he created, the Queen strongly preferred a pizza swathed in the colors of the Italian flag — red (tomato), green (basil), and white (mozzarella). Supposedly, this kind of pizza was then named after the Queen, although later research cast doubt on this legend. An official letter of recognition from the Queen's "head of service" remains on display in Esposito's shop, now called the Pizzeria Brandi. Pizza was brought to the United States with Italian immigrants in the late nineteenth century and first appeared in areas where Italian immigrants concentrated. The country's first pizzeria, Lombardi's, opened in 1905. Following World War II, veterans returning from the Italian Campaign, who were introduced to Italy's native cuisine proved a ready market for pizza in particular. Pizza dough being kneaded. After this, it is typically left undisturbed and allowed time to proof. In restaurants, pizza can be baked in an oven with stone bricks above the heat source, an electric deck oven, a conveyor belt oven or, in the case of more expensive restaurants, a wood or coal-fired brick oven. On deck ovens, pizza can be slid into the oven on a long paddle, called a peel, and baked directly on the hot bricks or baked on a screen (a round metal grate, typically aluminum). Prior to use, a peel may be sprinkled with cornmeal to allow pizza to easily slide onto and off of it. When made at home, it can be baked on a pizza stone in a regular oven to reproduce the effect of a brick oven. Cooking directly in a metal oven results in too rapid heat transfer to the crust, burning it. 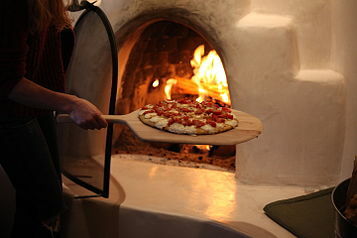 Aficionado home-chefs sometimes use a specialty wood-fired pizza oven, usually installed outdoors. Dome-shaped pizza ovens have been used for centuries, which is one way to achieve true heat distribution in a wood-fired pizza oven. Another option is grilled pizza, in which the crust is baked directly on a barbecue grill. Greek pizza, like Chicago-style pizza, is baked in a pan rather than directly on the bricks of the pizza oven. When it comes to preparation, the dough and ingredients can be combined on any kind of table. With mass production of pizza, the process can be completely automated. Most restaurants still use standard and purpose-built pizza preparation tables. 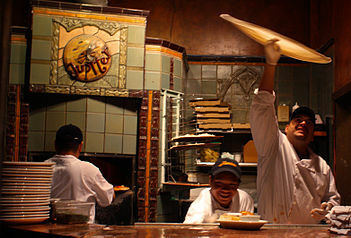 Pizzerias nowadays can even opt for hi tech pizza preparation tables that combine mass production elements with traditional techniques. The bottom of the pizza, called the "crust", may vary widely according to style, thin as in a typical hand-tossed Neapolitan pizza or thick as in a deep-dish Chicago-style. It is traditionally plain, but may also be seasoned with garlic or herbs, or stuffed with cheese. The outer edge of the pizza is sometimes referred to as the cornicione. Pizza dough often contains sugar, both to help its yeast rise and enhance browning of the crust. Dipping sauce specifically for pizza was invented by American pizza chain Papa John's Pizza in 1984 and has since become popular when eating pizza, especially the crust. 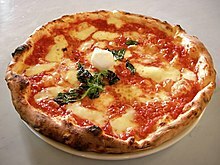 Mozzarella is commonly used on pizza, with the highest quality buffalo mozzarella produced in the surroundings of Naples. Eventually, other cheeses were used well as pizza ingredients, particularly Italian cheeses including provolone, pecorino romano, ricotta, and scamorza. 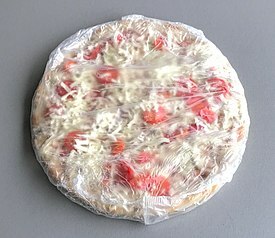 Less expensive processed cheeses or cheese analogues have been developed for mass-market pizzas to produce desirable qualities like browning, melting, stretchiness, consistent fat and moisture content, and stable shelf life. This quest to create the ideal and economical pizza cheese has involved many studies and experiments analyzing the impact of vegetable oil, manufacturing and culture processes, denatured whey proteins and other changes in manufacture. In 1997 it was estimated that annual production of pizza cheese was 1 million tonnes (1,100,000 short tons) in the U.S. and 100,000 tonnes (110,000 short tons) in Europe. Authentic Neapolitan pizza (pizza napoletana) is made with San Marzano tomatoes, grown on the volcanic plains south of Mount Vesuvius, and mozzarella di bufala Campana, made with milk from water buffalo raised in the marshlands of Campania and Lazio. This mozzarella is protected with its own European protected designation of origin. Other traditional pizzas include pizza alla marinara, which is topped with marinara sauce and is supposedly the most ancient tomato-topped pizza,pizza capricciosa, which is prepared with mozzarella cheese, baked ham, mushroom, artichoke and tomato, and pizza pugliese, prepared with tomato, mozzarella and onions. A popular variant of pizza in Italy is Sicilian pizza (locally called sfincione or sfinciuni), a thick-crust or deep-dish pizza originating during the 17th century in Sicily: it is essentially a focaccia that is typically topped with tomato sauce and other ingredients. Until the 1860s, sfincione was the type of pizza usually consumed in Sicily, especially in the Western portion of the island. Other variations of pizzas are also found in other regions of Italy, for example pizza al padellino or pizza al tegamino, a small-sized, thick-crust and deep-dish pizza typically served in Turin, Piedmont. 13% of the United States population consumes pizza on any given day. Pizza chains such as Domino's Pizza, Pizza Hut, and Papa John's, pizzas from take and bake pizzerias, and chilled or frozen pizzas from supermarkets make pizza readily available nationwide. Common toppings for pizza in the United States include ground beef, mushrooms, onions, pepperoni, pineapple, garlic, olives, peppers, carrots, tomatoes, spinach, anchovies, chicken, bacon, ham and sausage. Distinct regional types developed in the 20th century, including California, Chicago, Detroit, Greek, New Haven, New York and St. Louis styles. The first pizzeria in the U.S. was opened in New York's Little Italy in 1905 and since then regions throughout the U.S. offer variations, including deep-dish, stuffed, pockets, turnovers, rolled and pizza-on-a-stick, each with seemingly limitless combinations of sauce and toppings. Another variation is grilled pizza, created by taking a fairly thin, round (more typically, irregularly shaped) sheet of yeasted pizza dough, placing it directly over the fire of a grill and then turning it over once the bottom has baked and placing a thin layer of toppings on the baked side. Toppings may be sliced thin to ensure that they heat through, and chunkier toppings such as sausage or peppers may be precooked before being placed on the pizza. Garlic, herbs, or other ingredients are sometimes added to the pizza or the crust to maximize the flavor of the dish. Grilled pizza was offered in the United States at the Al Forno restaurant in Providence, Rhode Island by owners Johanne Killeen and George Germon in 1980. Although it was inspired by a misunderstanding that confused a wood-fired brick oven with a grill, grilled pizza did exist prior to 1980, both in Italy, and in Argentina where it is known as pizza a la parrilla. It has become a popular cookout dish, and there are even some pizza restaurants that specialize in the style. The traditional style of grilled pizza employed at Al Forno restaurant uses a dough coated with olive oil, strained tomato sauce, thin slices of fresh mozzarella, and a garnish made from shaved scallions, and is served uncut. The final product can be likened to flatbread with pizza toppings. Another Providence establishment, Bob & Timmy's Grilled Pizza, was featured in a Providence-themed episode of the Travel Channel's Man v. Food Nation in 2011. Argentina, and more specifically Buenos Aires, received a massive Italian immigration at the turn of the 19th century. Immigrants from Naples and Genoa opened the first pizza bars, though over time Spanish residents came to own the majority of the pizza businesses. Standard Argentine pizza has a thicker crust, called "media masa" (half dough) than traditional Italian style pizza and includes more cheese. Argentine gastronomy tradition, served pizza with fainá, which is a Genovese chick pea-flour dough placed over the piece of pizza, and moscato wine. The most popular variety of pizza is called "muzarela" (mozzarella), similar to Neapolitan pizza (bread, tomato sauce and cheese) but made with a thicker "media masa" crust, triple cheese and tomato sauce, usually also with olives. It can be found in nearly every corner of the country; Buenos Aires is considered the city with the most pizza bars by person of the world. Other popular varieties include jam, tomato slices, red pepper and longaniza. Two Argentine-born varieties of pizza with onion, are also very popular: fugazza with cheese and fugazzetta. The former one consists in a regular pizza crust topped with cheese and onions; the later has the cheese between two pizza crusts, with onions on top. The world's largest pizza was prepared in Rome in December 2012, and measured 1,261 square meters (13,570 square feet). The pizza was named "Ottavia" in homage to the first Roman emperor Octavian Augustus, and was made with a gluten-free base. The world's longest pizza was made in Fontana, California in 2017 and measured 1,930.39 meters (6,333.3 feet). The world's most expensive pizza listed by Guinness World Records is a commercially available thin-crust pizza at Maze restaurant in London, United Kingdom, which costs GB£100. The pizza is wood fire-baked, and is topped with onion puree, white truffle paste, fontina cheese, baby mozzarella, pancetta, cep mushrooms, freshly picked wild mizuna lettuce, and fresh shavings of a rare Italian white truffle. There are several instances of more expensive pizzas, such as the GB£4,200 "Pizza Royale 007" at Haggis restaurant in Glasgow, Scotland, which has caviar, lobster and is topped with 24-carat gold dust, and the US$1,000 caviar pizza made by Nino's Bellissima pizzeria in New York City, New York. However, these are not officially recognized by Guinness World Records. Additionally, a pizza was made by the restaurateur Domenico Crolla that included toppings such as sunblush-tomato sauce, Scottish smoked salmon, medallions of venison, edible gold, lobster marinated in cognac, and champagne-soaked caviar. The pizza was auctioned for charity in 2007, raising GB£2,150. In 2017, the world pizza market was $128 billion and in the US it was $44 billion spread over 76,000 pizzerias. Overall, 13% of the U.S. population aged 2 years and over, consumed pizza on any given day. Some mass-produced pizzas by fast food chains have been criticized as having an unhealthy balance of ingredients. Pizza can be high in salt, fat and calories (food energy). The USDA reports an average sodium content of 5,101 mg per 14 in (36 cm) pizza in fast food chains. There are concerns about negative health effects. Food chains have come under criticism at various times for the high salt content of some of their meals. Frequent pizza eaters in Italy have been found to have a relatively low incidence of cardiovascular disease and digestive tract cancers relative to infrequent pizza eaters, although the nature of the correlation between pizza and such perceived benefits is unclear. Pizza consumption in Italy might only indicate adherence to traditional Mediterranean dietary patterns, which have been shown to have various health benefits. Some attribute the apparent health benefits of pizza to the lycopene content in pizza sauce, which research indicates likely plays a role in protecting against cardiovascular disease and various cancers. National Pizza Month is an annual observance that occurs for the month of October in the United States and some areas of Canada. This observance began in October 1984, and was created by Gerry Durnell, the publisher of Pizza Today magazine. During this time, some people observe National Pizza Month by consuming various types of pizzas or pizza slices, or going to various pizzerias. Calzone and stromboli are similar dishes (a calzone is a pizza folded into a half-moon-shape; a stromboli is tube-shaped) that are often made of pizza dough rolled or folded around a filling. 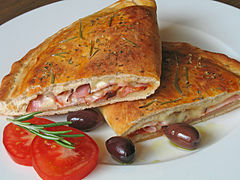 Panzerotti are similar to calzones, but fried rather than baked. "Farinata" or "cecina". A Ligurian (farinata) and Tuscan (cecina) regional dish made from chickpea flour, water, salt and olive oil. Also called socca in the Provence region of France. Often baked in a brick oven, and typically weighed and sold by the slice. The Alsatian Flammekueche (Standard German: Flammkuchen, French: Tarte flambée) is a thin disc of dough covered in crème fraîche, onions, and bacon. 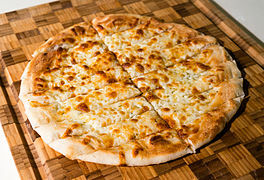 Garlic fingers is an Atlantic Canadian dish, similar to a pizza in shape and size, and made with similar dough. It is garnished with melted butter, garlic, cheese, and sometimes bacon. The Anatolian Lahmajoun (Arabic: laḥm bi'ajīn; Armenian: lahmajoun; also Armenian pizza or Turkish pizza) is a meat-topped dough round. The base is very thin, and the layer of meat often includes chopped vegetables. 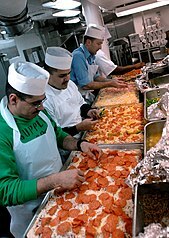 The Levantine Manakish (Arabic: ma'ujnāt) and Sfiha (Arabic: laḥm bi'ajīn; also Arab pizza) are dishes similar to pizza. The Macedonian Pastrmajlija is a bread pie made from dough and meat. It is usually oval-shaped with chopped meat on top of it. The Provençal Pissaladière is similar to an Italian pizza, with a slightly thicker crust and a topping of cooked onions, anchovies, and olives. Pizza bread is a type of sandwich that is often served open-faced which consists of bread, tomato sauce, cheese and various toppings. Homemade versions may be prepared. Pizza sticks may be prepared with pizza dough and pizza ingredients, in which the dough is shaped into stick forms, sauce and toppings are added, and it is then baked. Bread dough may also be used in their preparation, and some versions are fried. Pizza Rolls are a trade-marked commercial product. Okonomiyaki, a Japanese dish cooked on a hotplate, is often referred to as "Japanese pizza". "Zanzibar pizza" is a street food served in Stone Town, Zanzibar, Tanzania. It uses a dough much thinner than pizza dough, almost like filo dough, filled with minced beef, onions, and an egg, similar to Moroccan bestila. ^ a b c Maiden, Martin. "Linguistic Wonders Series: Pizza is a German(ic) Word". yourDictionary.com. Archived from the original on 2003-01-15. ^ a b Miller, Hanna (April–May 2006). "American Pie". American Heritage Magazine. Retrieved 4 May 2012. ^ Baofu, P. (2013). The Future of Post-Human Culinary Art: Towards a New Theory of Ingredients and Techniques. Cambridge Scholars Publisher. p. 281. ISBN 978-1-4438-4484-0. ^ "Associazione Verace Pizza Napoletana (AVPN)". Retrieved 11 July 2017. ^ France-Presse, Agence (2017-12-07). "Naples' pizza twirling wins Unesco 'intangible' status". The Guardian. ISSN 0261-3077. Retrieved 2017-12-07. ^ Babiniotis, Georgios (2005). Λεξικό της Νέας Ελληνικής Γλώσσας [Dictionary of Modern Greek] (in Greek). Lexicology Centre. p. 1413. ISBN 978-960-86190-1-2. ^ "Pizza, at Online Etymology Dictionary". Etymonline.com. Retrieved 2009-06-05. ^ "Pissa, Liddell and Scott, "A Greek-English Lexicon, at Perseus". Perseus.tufts.edu. Retrieved 2009-06-05. ^ "Pizza, at Dictionary.com". Dictionary.reference.com. Retrieved 2009-06-05. ^ 'pizza', Online Etymology Dictionary"
^ "Pizza". Garzanti Linguistica. De Agostini Scuola Spa. Retrieved 2014-01-31. ^ Perry, Charles (1991-06-20). "A Stone-Age Snack : History: Pizza topped with tomatoes, pepperoni and cheese is only 100 years old, if that. But the basic idea of pizza actually goes back thousands of years". Los Angeles Times. ISSN 0458-3035. Retrieved 2018-07-22. ^ Talati-Padiyar, Dhwani (2014-03-08). Travelled, Tasted, Tried & Tailored: Food Chronicles. ISBN 978-1304961358. Retrieved 18 November 2014. ^ Buonassisi, Rosario (2000). Pizza: From its Italian Origins to the Modern Table. Firefly. p. 78. ^ "Aeneas and Trojans fulfill Anchises' prophecy". Archived from the original on 2017-03-29. ^ a b Helstosky, Carol (2008). Pizza: A Global History. London: Reaktion. pp. 21–22. ISBN 978-1-86189-391-8. 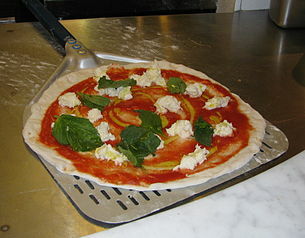 ^ "Pizza Margherita: History and Recipe". Italy Magazine. 14 March 2011. Retrieved 23 April 2012. ^ "Was margherita pizza really named after Italy's queen?". BBC Food. 28 December 2012. Retrieved 31 December 2012. ^ Hales, Dianne (2009-05-12). Sök på Google (in Swedish). ISBN 978-0767932110. Retrieved 2018-04-04. ^ Turim, Gayle. "A Slice of History: Pizza Through the Ages". History.com. Retrieved 9 November 2014. ^ Owens, Martin J. (2003). Make Great Pizza at Home. Taste of America Press. p. 3. ISBN 978-0-9744470-0-1. ^ Chen, Angus (23 July 2018). "Pizza Physics: Why Brick Ovens Bake The Perfect Italian-Style Pie". NPR. Retrieved 25 July 2018. ^ "pizza oven kits". Californo. Retrieved 2018-04-23. ^ "Automated pizza preparation table". rotopizza.club. Retrieved 27 May 2016. ^ Braimbridge, Sophie; Glynn, Joanne (2005). Food of Italy. Murdoch Books. p. 167. ISBN 978-1-74045-464-3. ^ DeAngelis, Dominick A. (December 1, 2011). The Art of Pizza Making: Trade Secrets and Recipes. The Creative Pizza Company. pp. 20–28. ISBN 978-0-9632034-0-3. ^ Shrikant, Adit (2017-07-27). "How Dipping Sauce for Pizza Became Oddly Necessary". Eater. Vox Media. Retrieved 28 July 2017. ^ Anderson, Sam (October 11, 2012). "Go Ahead, Milk My Day". The New York Times. NYTimes. Retrieved November 7, 2014. ^ Fox, Patrick F.; (); et al. (2000). Fundamentals of Cheese Science. Aspen Pub. p. 482. ISBN 978-0-8342-1260-2. ^ a b "Selezione geografica". Europa.eu.int. 2009-02-23. Archived from the original on 2005-02-18. Retrieved 2009-04-02. ^ "La vera storia della pizza napoletana". Biografieonline.it. 2013-05-20. Retrieved 2015-12-08. ^ Guides, Rough (2011-08-01). Rough Guide Phrasebook: Italian: Italian. p. 244. ISBN 978-1-4053-8646-3. ^ Wine Enthusiast, Volume 21, Issues 1-7. Wine Enthusiast. 2007. p. 475. ^ "What is Sicilian Pizza?". WiseGeek. Retrieved 14 April 2013. ^ Giorgio Locatelli (2012-12-26). Made In Sicily. ISBN 978-0-06-213038-9. Retrieved 2013-07-04. ^ Gangi, Roberta (2007). "Sfincione". Best of Sicily Magazine. Archived from the original on 2014-04-02. ^ "Torino: la riscoperta della pizza al padellino". Agrodolce. 2014-04-03. Retrieved 2015-12-08. ^ "Pizza al padellino (o tegamino): che cos'è?". Gelapajo.it. Archived from the original on 2015-12-10. Retrieved 2015-12-08. ^ "Beniamino, il profeta della pizza gourmet". Torino - Repubblica.it. Retrieved 2015-12-08. ^ Rhodes, Donna G.; Adler, Meghan E.; Clemens, John C.; LaComb, Randy P.; Moshfegh, Alanna J. "Consumption of Pizza" (PDF). Food Surveys Research Group. Retrieved 25 September 2014. ^ Otis, Ginger Adams (2010). New York City 7. Lonely Planet. p. 256. ISBN 978-1741795912. Retrieved November 1, 2012. ^ Byrn, Anne (2007). What Can I Bring? Cookbook. Workman Publishing. pp. 63–64. ISBN 978-0761159520. ^ Chandler, J. (2012). Simply Grilling: 105 Recipes for Quick and Casual Grilling. Thomas Nelson. p. 29. ISBN 978-1-4016-0452-3. ^ Delpha, J.; Oringer, K. (2015). Grilled Pizza the Right Way: The Best Technique for Cooking Incredible Tasting Pizza & Flatbread on Your Barbecue Perfectly Chewy & Crispy Every Time. Page Street Publishing. p. 191. ISBN 978-1-62414-106-5. ^ a b c "Great Grilled Pizza". Cook's Illustrated. July 1, 2016. Retrieved October 28, 2016. ^ Spinetto, H. (2007). Pizzerías de valor patrimonial de Buenos Aires (in Spanish). Patrimonio e Instituto Histórico. p. 159. ISBN 978-987-1037-67-4. ^ Dixler, Hillary (March 19, 2014). "The Grilled Pizza Margarita at Al Forno in Providence". Eater. Retrieved October 28, 2016. ^ "Providence Featured on Travel Channel's Man V. Food Nation". City of Providence. August 4, 2011. Retrieved October 28, 2016. ^ Leire Gómez (17 July 2015). "Buenos Aires: la ciudad de la pizza". Tapas Magazine. ^ Cecilia Acuña (26 June 2017). "La historia de la pizza argentina: ¿de dónde salió la media masa?". La Nación. ^ "Los inventores de la fugazza con queso". Clarín. 12 February 2006. ^ "Largest pizza". Guinness World Records. Retrieved 2016-11-17. ^ "Longest pizza". Guinness World Records. Retrieved 13 October 2018. ^ "Most expensive pizza". Retrieved 4 October 2014. ^ Shaw, Bryan (March 11, 2010). "Top Five Most Expensive Pizzas in The World". Haute Living. Retrieved 9 September 2014. ^ Conway, Lawrence (June 18, 2012). "New York restaurant serving up $1,000 PIZZA... decadent dish is topped with two of the world's top caviars". Daily Mail. Retrieved 9 September 2014. ^ "Chef cooks £2,000 Valentine pizza". BBC News. 2007-02-14. Retrieved 2012-07-07. ^ Hynum, Rick. "Pizza Power 2017 - A State of the Industry Report". PMQ Pizza Magazine. Retrieved 28 July 2017. ^ Rhodes, Donna; et al. (February 2014). "Consumption of Pizza" (PDF). Food Surveys Research Group Dietary Data Brief No. 11. USDA. Retrieved 27 September 2017. ^ "Basic Report 21299". National Nutrient Database for Standard Reference. 2014-09-28. Archived from the original on 2014-11-07. Retrieved 2014-09-28. ^ "Survey of pizzas". Food Standards Agency. 2004-07-08. Archived from the original on 2005-12-28. Retrieved 2009-04-02. ^ "Health | Fast food salt levels "shocking"". BBC News. 2007-10-18. Retrieved 2009-04-02. ^ a b Gallus, Silvano; Bosetti, Cristina; Negri, Eva; Talamini, Renato; Montella, Maurizio; Conti, Ettore; Franceschi, Silvia; La Vecchia, Carlo (2003). "Does pizza protect against cancer?". International Journal of Cancer. 107 (2): 283–284. doi:10.1002/ijc.11382. ^ Adetayo O. Omoni, Rotimi E. Aluko. "The anti-carcinogenic and anti-atherogenic effects of lycopene: a review", Trends in Food Science & Technology, Volume 16, Issue 8, August 2005, Pages 344–350, Retrieved on 5 October 2014. ^ a b Genovese, Peter (2013-05-13). Pizza City. p. 97. ISBN 9780813558691. Retrieved 16 October 2014. ^ Lund, Joanna M. (2007). Pizza Anytime. p. 4. ISBN 9780399533112. Retrieved 16 October 2014. ^ The Oxford Encyclopedia of Food and Drink in America. Oxford University Press. 2013-01-31. p. 643. ISBN 9780199734962. Retrieved 16 October 2014. ^ a b "National Pizza Month". Pizza.com. Retrieved 15 October 2014. ^ "Brick Oven Cecina". Fornobravo.com. Retrieved 2009-04-02. ^ Helga Rosemann, Flammkuchen: Ein Streifzug durch das Land der Flammkuchen mit vielen Rezepten und Anregungen (Offenbach: Höma-Verlag, 2009). ^ Adler, Karen; Fertig, Judith (2014). Patio Pizzeria. Running Press. p. 67. ISBN 978-0-7624-4966-8. ^ McNair, James (2000). James McNair's New Pizza. Chronicle Books. p. 53. ISBN 978-0-8118-2364-7. ^ Magee, Elaine (2009). The Flax Cookbook. Da Capo Press. p. 130. ISBN 978-0-7867-3062-9. ^ Wilbur, Todd (1997). Top Secret Restaurant Recipes. Penguin. p. 27. ISBN 978-1-4406-7440-2. ^ "hanamiweb.com". Archived from the original on 18 March 2007. Retrieved 7 December 2015. ^ Samuelsson, Marcus. "The Soul of a New Cuisine: A Discovery of the Foods and Flavors of Africa". Houghton Mifflin Harcourt. New York: 2006. "The Saveur Ultimate Guide to Pizza". Saveur. Retrieved 2 November 2014. Kliman, Todd (September 5, 2012). "Easy as pie: A Guide to Regional Pizza". The Washingtonian. Explanation of eight pizza styles: Maryland, Roman, "Gourmet" Wood-fired, Generic boxed, New York, Neapolitan, Chicago, and New Haven. Helstosky, Carol (2008). Pizza: A Global History. London: Reaktion Books. ISBN 978-1-86189-391-8. OCLC 225876066. Chudgar, Sonya (March 22, 2012). "An Expert Guide to World-Class Pizza". QSR Magazine. Retrieved October 16, 2012. * Raichlen, Steven (2008). The Barbecue! Bible. Workman Publishing. pp. 381–384. ISBN 978-0761149446. Delpha, J.; Oringer, K. (2015). Grilled Pizza the Right Way. Macmillan. ISBN 978-1-62414-106-5. 208 pages. Bui, Quoctrung (February 26, 2014). "74,476 Reasons You Should Always Get the Bigger Pizza". NPR. Planet Money (news blog).